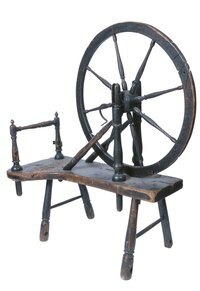 Antique spinning wheels are artifacts used for spinning animal or plant fibers into continuous threads of yarn. Old spinning wheels can be restored and used to make yarn from a wide variety of fibrous material. Plant fibers spun into yarn for knitting or weaving fabric include cotton, hemp, flax and sisal. Some commonly spun animal fibers are silk, wool from sheep, alpacas, llamas and mohair goats. Spinning your own yarn has many advantages. You get to choose the exact color, texture and thickness of your homemade yarn. Buy an antique, three-legged Saxony style spinning wheel from an antiques dealer, antique mall, or at an antiques show or auction. It's the most common type. Inspect it carefully to make sure all the parts are present and work properly. Do any restoration work necessary to make the wheel functional. Check the bearings and drive band to see if they need to be replaced. Make sure the fly-wheel spins true, without wobbling or creaking. Assemble the required spinning accessories. Find a comfortable stool. Get a niddy-noddy to collect and wind the yarn into skeins as it comes off the bobbin. Locate a ball-winder to wrap the yarn around a core to make bulk yarn balls. Use a lazy-Kate to wind the yarn onto spools. Select the type of fiber you want to draw out and twist into yarn. Start out with coarse wool or long-fibered plant material such as hemp. Align the fibers and separate long from short strands with a pair of Dutch combs. Put the fiber on the stationary comb and brush it with the hand comb. Use a pair of hand carders to straighten and organize the fiber in preparation for spinning. Cover the wire teeth of one carder with fiber and brush it with the other. Roll the separated fibers into a tubular shape called a rolag. Pull out, or draft, some fiber from the rolag with one hand, while twisting it together with the fingers of the other hand. Control the thickness of the yarn by the amount you draft. Knot one end of a two-foot long leader of plied fiber to the bobbin. Thread the other end through the flyer hooks and the orifice. Tie a loop on the leader's loose end to attach more fiber or make a join by fluffing the ends and twisting rolag fiber into the leader. Slowly pump the treadle with your foot to spin the flywheel clockwise. Wind the yarn around the wheel. Keep the flyer and bobbin rotating evenly. Establish a rhythm of pinching, twisting and feeding the yarn through the orifice. Adjust the brake band to set the tension, keeping the yarn winding evenly onto the bobbin. Make a join by fluffing and twisting the ends of the fiber together when you start spinning a new rolag. Draft the fiber at a consistent rate to spin yarn of uniform thickness. Keep the flywheel spinning at constant rate, don't let it stop and reverse direction.